Rose Geranium has been used in skin and hair preparations to help balance the secretion of sebum and clear sluggish and oily skin. It helps improve the appearance of broken capillaries and varicose veins. Rose Geranium helps balance the water system in the body especially the lymphatic system to help detoxify the body and diminish the signs of cellulite. Its balancing properties soothe and calm dry skin conditions and help clear up oily skin when used as an astringent. Rose Geranium is often used for acne, bruises, sunburns and eczema. A hair or skin tonic made with an infusion of Rose Geranium helps cleanse and normalize pH of the skin and scalp. Rose Geranium, used aromatically and topically, helps balance hormones and brings relief to pain and irritation brought on by painful menstruation, pre-menstrual syndrome and other menopausal difficulties. 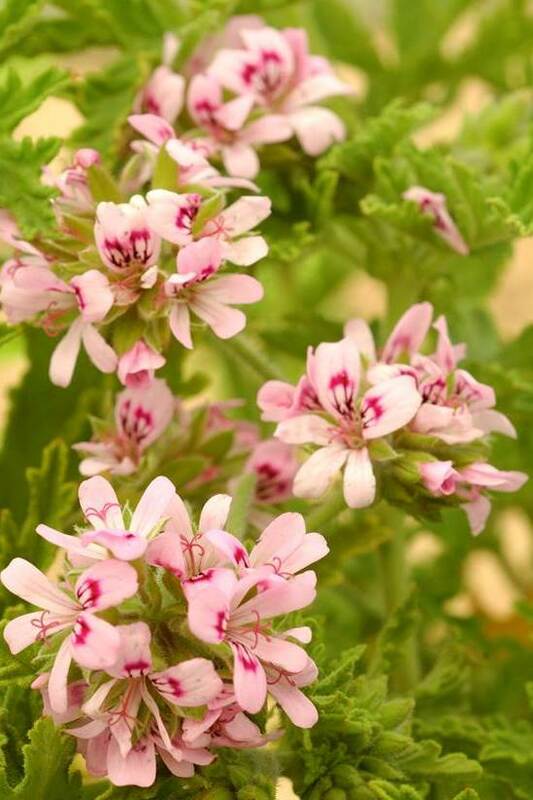 Rose Geranium offers anti-bacterial and anti-fungal properties. It is used for acne, dermatitis, eczema, wounds, bruises hemorrhoids, varicose veins, sore throats and neuralgia. Rose Geranium Essential Oil should be diluted before use.